Installing an Android app from the Android Market is very simple. You just click a button and the app is installed. However if you want to install an app that is not available in the Android Market, then the procedure is different. • Go to Menu > Settings > Applications and check the option that says Unknown Sources. This enables the installation of android apps on your android phone from sources other then Android Market. • Now install a file explorer or browser on your Android phone. You will need this to access the .apk file in your memory card (or SD card). There are many file manager apps available in the Android Market and you can use any one of them. We will use Astro File Manager for this tutorial. Install it from here. • After installing the Astro file manager, connect your Android mobile phone to your computer and copy the .apk file to your memory card. • Now from your Android phone, navigate to the copied .apk file and click on it. 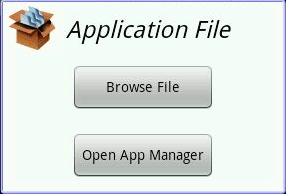 A dialog box will open asking you to either ‘Browse File’ or ‘Open App Manager’. Click on ‘Open App Manager’. Click Next on the next window. then click Next again. That’s it. You just installed a .apk file on your Android phone.